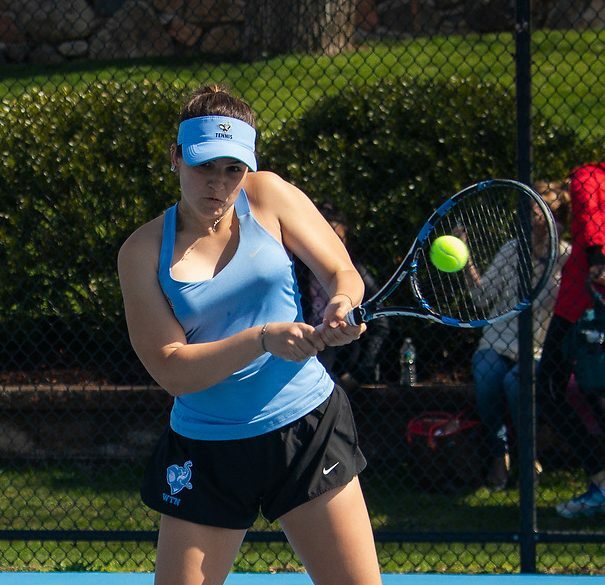 Tufts women’s tennis dropped two matches to close out the month of March, sliding to 3–4 in its spring season. On March 31, the Jumbos fell to the Wesleyan Cardinals 5–1, playing only six matches until the decision could be reached. Normally, women’s tennis plays nine matches in head-to-head contests, but inclement weather forced both the men and women inside. Because the men’s team was locked in a grueling contest with Wesleyan, which they narrowly lost 5–4, the women did not begin play until 5:30 p.m. in the Gantcher Center, 2.5 hours after the intended start time. The Cardinals agreed to play no longer than necessary given the delay. The Jumbos got off to a strong start: First-year doubles duo Maggie Dorr and Caroline Garrido grabbed an 8–2 win to put the Jumbos ahead 1–0. They trounced a pair of sisters ranked fifth nationally on the Wesleyan side: senior Victoria Yu and first-year Kristina Yu. However, Wesleyan was unfazed and battled back to regain the lead in the doubles matchups. Tufts lost a tight tiebreaker in its No. 3 doubles when first-year Anna Lowy and junior Kat Wiley fell to two Wesleyan underclassmen 8–7 (7–4). The Cardinal lead continued to grow with a singles win by Kristina Yu over sophomore Patricia Obeid, 6–2, 6–2. Jumbo first-year Nicole Frankel also dropped her match 6–2, 6–2, leaving the Cardinals one win away from a victory. Victoria Yu clinched Wesleyan’s victory with a 6–2, 6–4 win over Tufts’ Maggie Dorr. The No. 2, 5 and 6 singles matches went unfinished, much to the chagrin of senior Tomo Iwasaki, who was locked in a tight battle against Venia Young, the No. 4 ranked singles player nationally. But it was too little too late — the Cardinals had already won. With the win, Wesleyan advanced to 8–1 and 3–0 in NESCAC play. Tufts extended its losing streak to three and now stands at 2–2 in the NESCAC, falling to 3–4 after a strong 3–1 overall start. Nonetheless, its coach is proud of the progress being made. Two days prior, on March 29, the Jumbos played their first home head-to-head matchup against Bowdoin College. The matches were also moved indoors due to rain, and the Polar Bears capitalized with a 7–2 win. Bowdoin started off strong, sweeping all three doubles matches — its No. 1 and 3 doubles both secured 8–3 pro-sets, defeating Dorr/Garrido and Wiley/Lowy, respectively. Its No. 2 doubles won 8–4, with veterans Iwasaki/Obeid faltering on the Jumbo side as well. However, Iwasaki and Obeid each came back with a vengeance, securing victories in singles matches. Unfortunately, that would be the only taste of victory Tufts would earn all day, with Garrido, Wiley, Frankel and Dorr all falling in their singles matches. Dorr was locked in a struggle against Bowdoin’s Julia Marks, but ultimately was ousted in two sets that went to tiebreakers. Losing 7–6 (7–5), 7–6 (8–6), she put up an admirable effort, but it was not enough to add another “W” to score another win for the Jumbos. Tufts is a young team; six out of its nine players are underclassmen. Four are first-years, so while losses are never ideal, the first-years in particular have much potential and are sure to keep working hard to achieve greater results. Coming off of the stinging defeats at home to close out March, Tufts looks forward to hosting the Emory Eagles, the No. 1 team in the nation, on April 5.